The French Navy is currently testing lightweight Autonomous Underwater Vehicles (AUV) as a preliminary to receiving six more over the coming months. At this point, the tests are conclusive. Two meters and 70 kilos: these are the measurements of the Alister 100 AUV, which will soon become the Navy’s first underwater drones for mine warfare. They will be used by the GPD for advanced operations (such as in very shallow water, or for channel assault) and for port clearance, and for secondary missions such as seabed survey and reconnaissance. A contract was awarded in late 2010 by the Directorate General of Armaments for the supply of six AUVs for the Mine Disposal Diver Group. Operationally, two sailors sitting on a dock or on board an inflatable boat can operate the AUV. Equipped with advanced systems and sensors, this underwater vehicle is capable of very accurate navigation. It will facilitate minehunting work in narrow sea areas such as channels or inlets. This same precision also will be a major asset in the exchange of information with other combat systems used for mine warfare. As for its Klein-type sonar, it will operate on different frequencies in order to favor either sensing range or image definition, depending on operational circumstances. 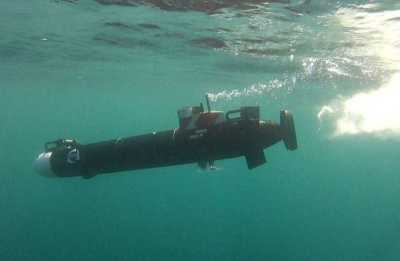 The contract includes the phased delivery of the first six Alister AUV 100s by the end of 2013. After the current phase, the Naval staff will have to decide whether to commission this device into active service before it can be used for operational missions.